⑴ Count your rainbows not your thunderstorms. ⑵ That way I see it. if you want the rainbow. you gotta put up with the rain. 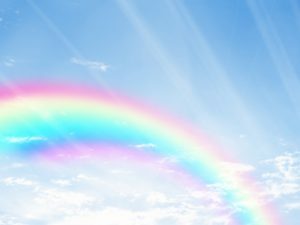 ⑶ Somewhere over the rainbow skies are blue and the dreams that you dare to dream really do come true. ⑷ Life is like a rainbow . you need both the sun and the rain to make its color appear . ⑸ If you wish for a life without pain. you will never see the beauty of a rainbow after the rain. ⑹ Friendship is a rainbow between two hearts sharing 7 colors: Secrets, Truth,Sadness,Faith,Happiness,Respect,Love. ⑺ No matter how long the rain lasts there will be a rainbow in the end. No matter how sad you maybe , believe that happiness is waiting. ⑻ When you reduce life to black and the white you never see rainbows. ⑼ The greater your storm the brighter your rainbow. ⑽ May the tears in your eyes create a rainbow in your life.